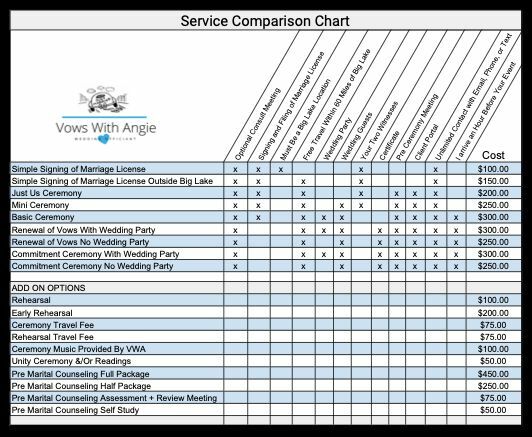 Vows With Angie understands that everyone has different needs, priorities, and budgets. So the services are basic and allow you to add the options that are important to you. Why pay for something that you don't need? This is optional. Only for those of you who would like to meet before you hire. At this meeting, we will go over all the details of your ceremony and answer any questions you or I may have. This is typically scheduled to take place about two weeks before your ceremony and is held in Big Lake at the Vows With Angie office. After your down payment is received, I send you a link to access my hidden website. Here you will find the resources you need to plan your ceremony. ​(e.g. Vows, Ring Blessings, Readings, etc...). ​I will sign and file your Marriage License for you. I arrive at your ceremony one hour before it begins. This allows me to consult with other professionals involved with your special day (e.g. DJ, Photographer, Coordinator, etc). I will sign and file your Marriage License for you. a Travel Fee of $75.00 will apply. Receive a personalized certificate with your names and date of your Renewal of Vows. You pick the music and VWA will take care of the rest. Add personal touches to your ceremony by adding a Unity Ceremony or Readings. A Unity Ceremony is a great way to symbolize the joining of two individual lives becoming one. There are many different types of Unity Ceremonies allowing couples to find one that represents them well. I challenge you to come up with your own. Readings are a great way to incorporate loved ones into the ceremony and to help set a tone. Don't have a responsibility for your God Mother? Ask her to read a personally selected by you reading. I perform ceremonies anywhere in the state of MN. However, if your location is more than 60 miles from Big Lake MN (via mapquest) there is a travel fee to cover the additional time and cost of the extra travel. I perform rehearsals anywhere in the state of MN. However, if your location is more than 60 miles from Big Lake MN (via mapquest) there is a travel fee to cover the additional time and cost of the extra travel. This would be in addition to the ceremony travel fee. This is due to the fact that I would be making the trip twice. Requires an additional $50.00 Deposit to hold the date in addition to your ceremony. Big Lake Witness - Need someone to witness your marriage and sign your marriage license?